Download "MS-10751: Configuring and Deploying a Private Cloud with System Center 2012. Required Exam(s) Course Objectives. Price. Duration. Methods of Delivery"
1 MS-10751: Configuring and Deploying a Private Cloud with System Center 2012 This course teaches students how to design, install and configure a private cloud, including how to configure and deploy the application infrastructure as well as the key components of System Center 2012 that are necessary for delivering services on the private cloud infrastructure. 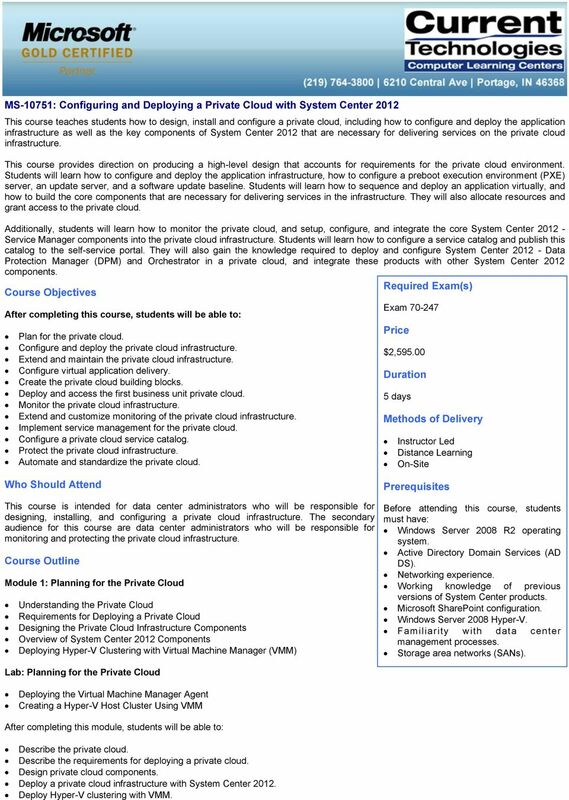 This course provides direction on producing a high-level design that accounts for requirements for the private cloud environment. Students will learn how to configure and deploy the application infrastructure, how to configure a preboot execution environment (PXE) server, an update server, and a software update baseline. Students will learn how to sequence and deploy an application virtually, and how to build the core components that are necessary for delivering services in the infrastructure. They will also allocate resources and grant access to the private cloud. 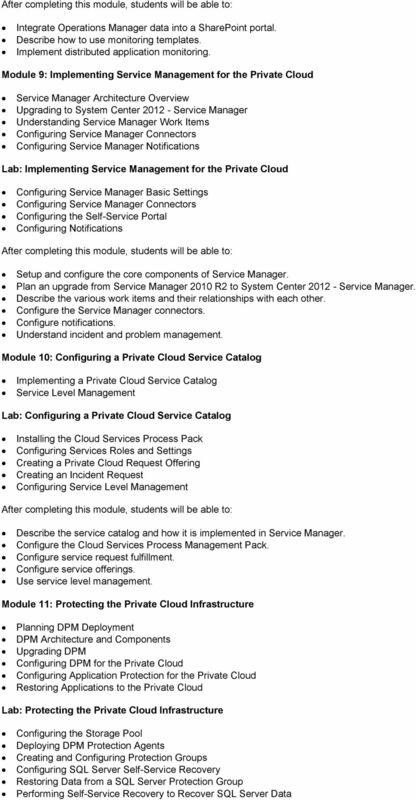 Additionally, students will learn how to monitor the private cloud, and setup, configure, and integrate the core System Center Service Manager components into the private cloud infrastructure. Students will learn how to configure a service catalog and publish this catalog to the self-service portal. They will also gain the knowledge required to deploy and configure System Center Data Protection Manager (DPM) and Orchestrator in a private cloud, and integrate these products with other System Center 2012 components. 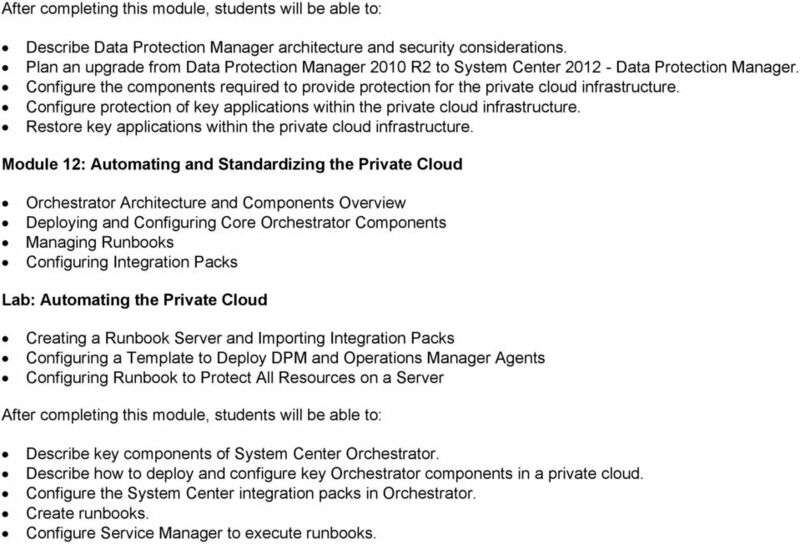 Required Exam(s) Course Objectives After completing this course, students will be able to: Plan for the private cloud. Configure and deploy the private cloud infrastructure. Extend and maintain the private cloud infrastructure. Configure virtual application delivery. Create the private cloud building blocks. Deploy and access the first business unit private cloud. Monitor the private cloud infrastructure. Extend and customize monitoring of the private cloud infrastructure. Implement service management for the private cloud. Configure a private cloud service catalog. Protect the private cloud infrastructure. Automate and standardize the private cloud. Exam Price $2, Duration 5 days Methods of Delivery Instructor Led Distance Learning On-Site Who Should Attend This course is intended for data center administrators who will be responsible for designing, installing, and configuring a private cloud infrastructure. The secondary audience for this course are data center administrators who will be responsible for monitoring and protecting the private cloud infrastructure. 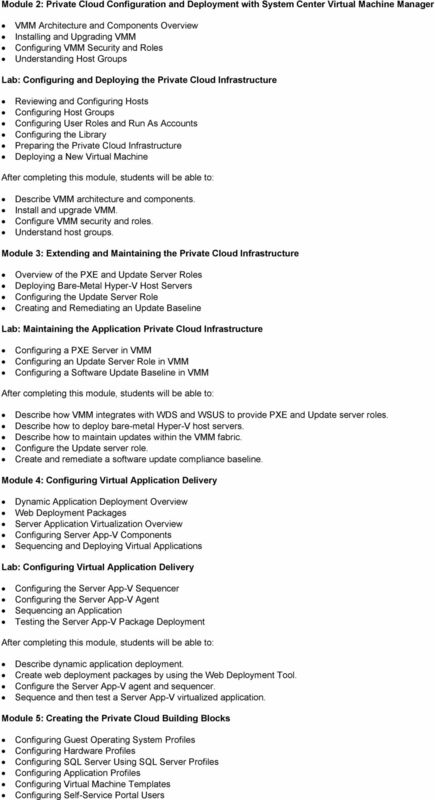 Course Outline Module 1: Planning for the Private Cloud Understanding the Private Cloud Requirements for Deploying a Private Cloud Designing the Private Cloud Infrastructure Components Overview of System Center 2012 Components Deploying Hyper-V Clustering with Virtual Machine Manager (VMM) Prerequisites Before attending this course, students must have: Windows Server 2008 R2 operating system. Active Directory Domain Services (AD DS). Networking experience. Working knowledge of previous versions of System Center products. Microsoft SharePoint configuration. Windows Server 2008 Hyper-V. Familiarity with data center management processes. Storage area networks (SANs). Lab: Planning for the Private Cloud Deploying the Virtual Machine Manager Agent Creating a Hyper-V Host Cluster Using VMM Describe the private cloud. Describe the requirements for deploying a private cloud. Design private cloud components. Deploy a private cloud infrastructure with System Center Deploy Hyper-V clustering with VMM. 5 Describe Data Protection Manager architecture and security considerations. Plan an upgrade from Data Protection Manager 2010 R2 to System Center Data Protection Manager. Configure the components required to provide protection for the private cloud infrastructure. Configure protection of key applications within the private cloud infrastructure. Restore key applications within the private cloud infrastructure. Module 12: Automating and Standardizing the Private Cloud Orchestrator Architecture and Components Overview Deploying and Configuring Core Orchestrator Components Managing Runbooks Configuring Integration Packs Lab: Automating the Private Cloud Creating a Runbook Server and Importing Integration Packs Configuring a Template to Deploy DPM and Operations Manager Agents Configuring Runbook to Protect All Resources on a Server Describe key components of System Center Orchestrator. Describe how to deploy and configure key Orchestrator components in a private cloud. Configure the System Center integration packs in Orchestrator. Create runbooks. Configure Service Manager to execute runbooks. Course Outline. Course Details Course code: 20246D Duration: 5 days Starting time: 9am Finishing time: 4.30pm Lunch and refreshments are provided. Course Outline. Create and configure virtual hard disks. Create and configure virtual machines. Install and import virtual machines. Course 20416B: Implementing Desktop Application Environments NEW!